Some of our favorites were found inside the massive wheel and tire hall, which may have been more than an entire mile from end to end! 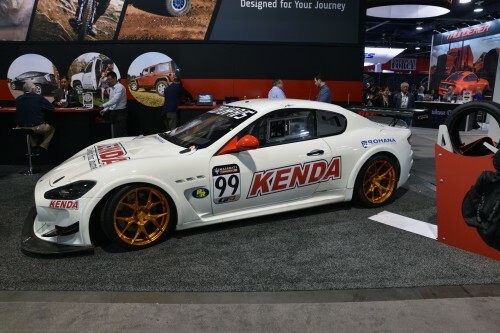 The first was the Kenda Tires Maserati GranTurismo with gold wheels and showing some serious track use with nicks and scratches everywhere. It makes us want to bolt a wing and some throw some slicks on one of our GTs to share in on all the fun! How about the Vörsteiner Wheels Ferrari Italia 458 with gold wheels? Yes please. The extremely aggressive front end and an Italian flag along the hood made this a show stopper of a vehicle. 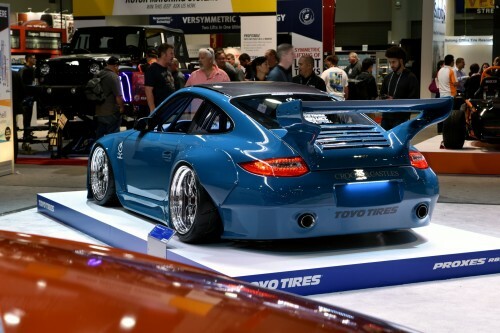 One of the more unique Porsche’s at the show was found at the Toyo Tires booth. A throwback to the slantnose 911, this Porsche was equipped with massive fender flares, beautiful wheels and a integrated exhaust that set the entire build off just right. If those didn’t do it for you, check out our gallery of just a few of the hundreds of vehicles that were at the show this year! Print article This entry was posted by Adam Karon on November 8, 2016 at 12:51 pm, and is filed under Blog. Follow any responses to this post through RSS 2.0. You can leave a response or trackback from your own site.